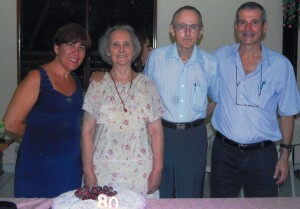 Imogene and Bill Burk celebrate Imogene’s birthday with Marcos Freitas, right, and his wife, Selma, left. This message was submitted by Marcos Freitas of Brazil, who knew Bill and Imogene Burk. Bill, known by many as “Amazon Bill,” died Wednesday in Washington State after serving more than 50 years as a missionary in Brazil. I would like to give you a testimony about the missionaries Imogine and Bill Burk in Brazil. When I met them, in 2007, they had already built roughly a dozen of churches in Amazon Forest. I did not have the opportunity of being with them that time. However, I can say that since I and my wife have become friends of them in Vila dos Cabanos, the last village where they lived in Amazon Forest and have built a beautiful church, we have been blessed. Not only us, but everybody of the village. They were real prophets of our Lord Jesus Christ. People used to respect them a lot, for they were counselors of brothers who come from many places. Even in their eighties, they used to have time, health and strength to confort couples, husbands, wives, fathers, mothers, brothers, children, disciples, pastors and any others. I used to study the Bible with him once a week and so, a lot of people enjoyed to do it. I’d like to say much more, because they deserve to be recalled as great servants of our Lord God. I hope you and Sister Imogine are fine with your children and grandchildren. You are very special for me and Selma, and not only for us, but for a lot of people in Brasil, and so in the USA. We don’t know whether we will have an opportunity of meeting in the earth again, but we do know that we’ll be joining in the heavens. For twenty years, they were our spiritual concelers and we miss them so much. Me and my family are glad they have contributed for our development in God's word. I still remember the last time I saw them and miss the soud of their voices singing and praying in the church. Our country has never get a so much great gift from heaven like them. I hope our God take care of all their family and relatives. For Pastor Garry e his wife Ester, our best regards. We still have a picture from them with their four childrem when they were in our home in Vila dos Cabanos. God bless us until the last second of our life!